I notice that larvae of this species develop very fast, while they spend most of their time as eggs and pupae, as the majority of brood mostly is. I've got news even better than yesterdays!! They've FINALLY moved out of the tubing and they allowed me to get some pictures. Here's the information I was able to gather. Brood Count: 8 pupae remain, 30+ eggs have been laid (they're clumped, but you can count at least 26 on the surface alone), and they have a few larvae. 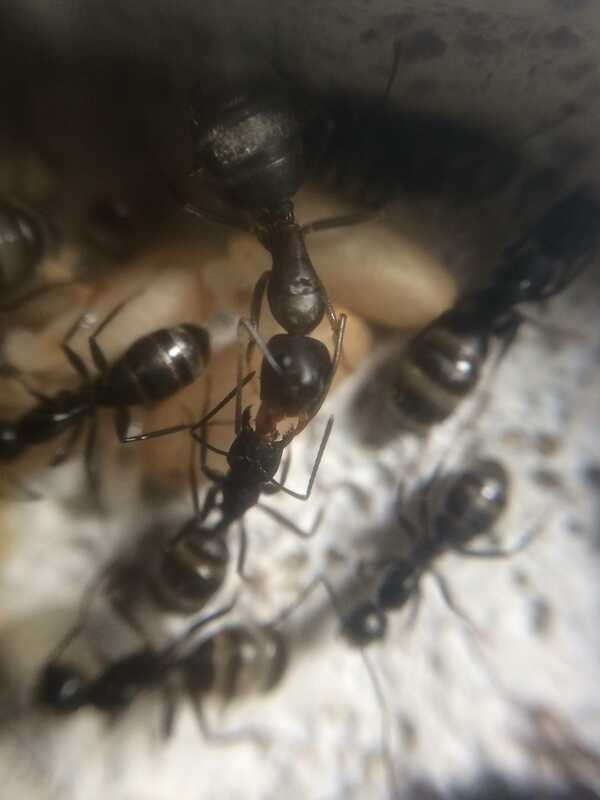 Age: This colony got its first workers on July 5th, so it's about a month and a half old. 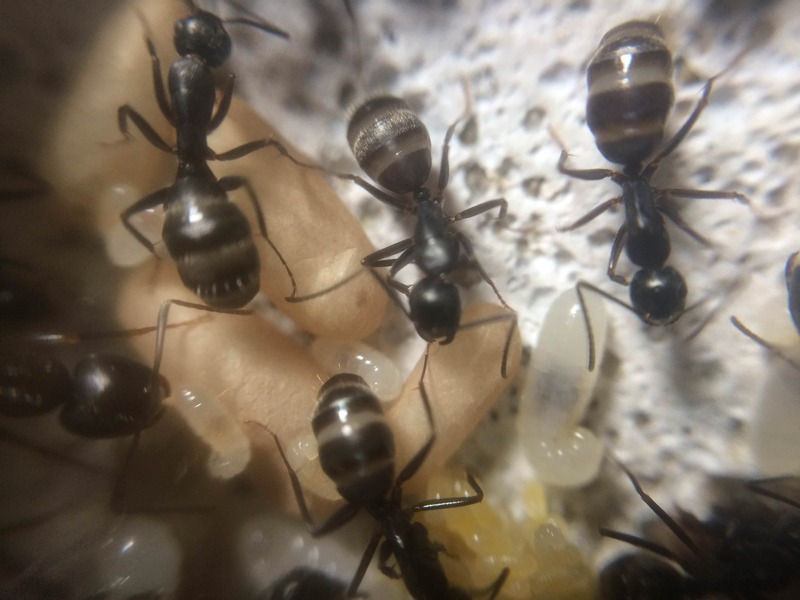 I just wonder if this colony will be able to develop those eggs before diapause. We could potentially be pushing 40+ workers this year. Man i see that they are doing great! I am new to this and I have just founded my first colonies! I understand why pupating would take a while, but I wonder why eggs take so long to hatch. I assume heat is a factor though. It used to take my previous colonies about 2 months from egg to worker but now in 30-degree heat, egg to worker took a month and a week. 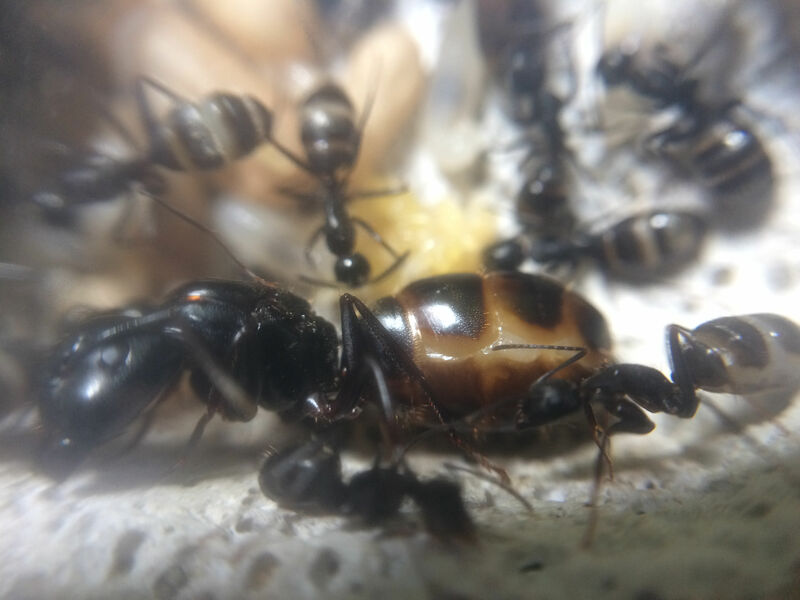 I find that Camponotus thrive in heat. Do you keep this species too? They're so fun. I wish! 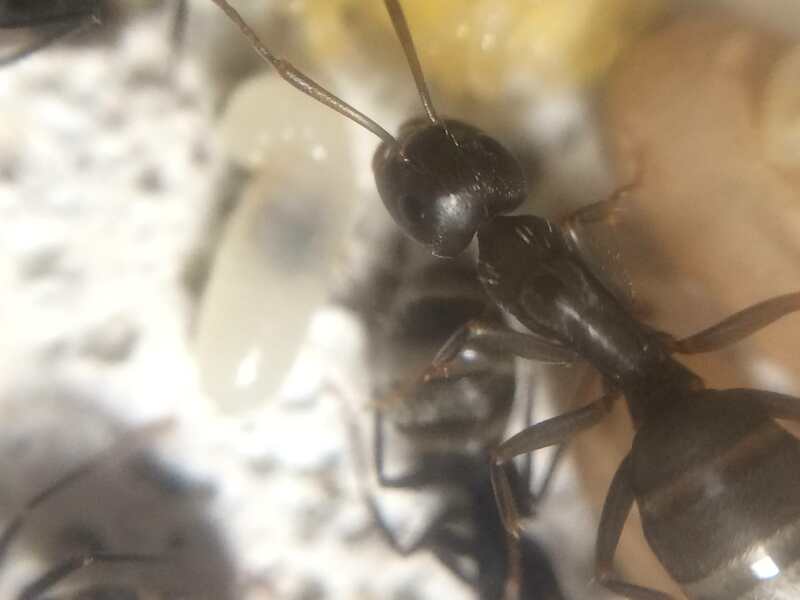 but I'm one of the few european ant keepers in this community, altough i am looking towards finding a Camponotus queen next year! There isn't much of an update today, but here's what has happened so far. We've hit 23 workers! There's 3 larva that pupated so that replaced the enclosed workers and added another. I am confident looking at their brood pile that I will be getting either a full sized minor OR a tiny major. It's not even that the pupa is longer, it's significantly wider than all of the other pupa. I'm very excited about that. 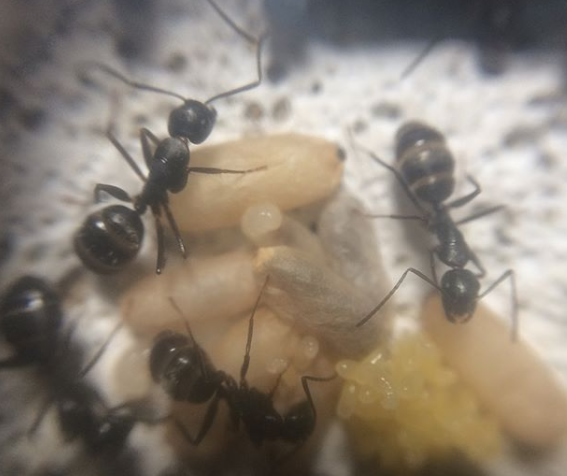 On a separate note, all of those eggs shown in the picture have hatched and the queen's abdomen is growing exponentially so I'm now 100% confident that those aren't their last batch of eggs. Which means this colony could actually double in population AGAIN before the year is over. I presume when the queen lays their final batch of eggs (in the next coming weeks) they'll allow them to grow into small larva and then I'll be able to hibernate them. If this batch works out like the previous one, it'll only take about a month and a half to get all the current larva to workers. That'll be somewhere near the end of October (Worst case scenario). If they still need a week or two I'll give them it since they can't hibernate with pupa or eggs. I cannot be more happy with the results of this colony. 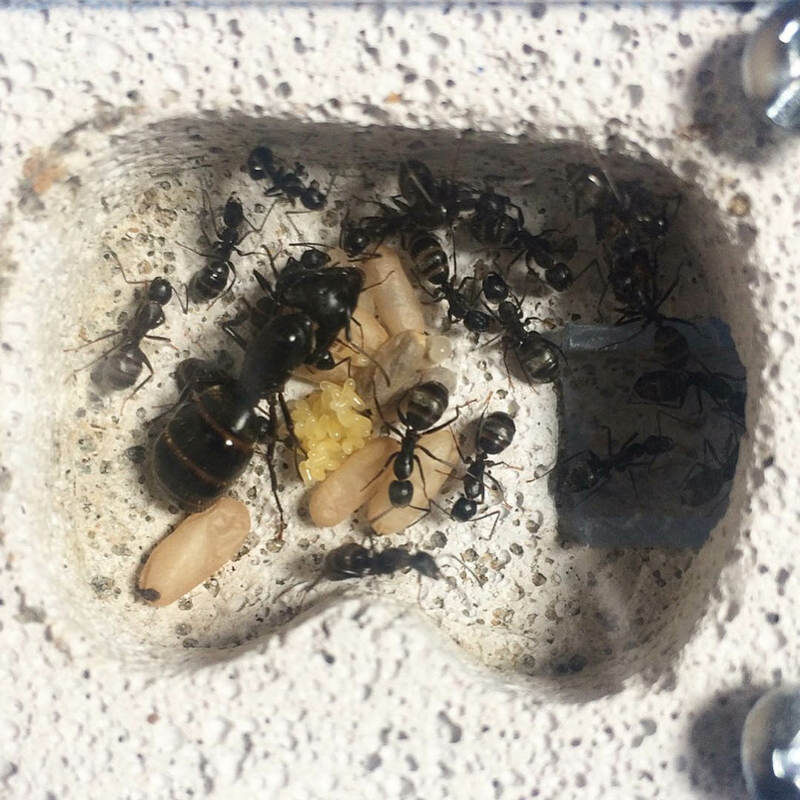 The biggest showing I've had from a Camponotus colony was last year was 21 workers from my Novaeboracensis. This is just crazy. They're at 25 workers now. Pupa suspected to be a mini major is getting darker, expecting it mid-way through next week. All eggs laid have hatched so this confirms that we will be getting another generation of workers before hibernation. Larva pupating to Pupa enclosing is now a 2:1 ratio. They only have a couple of pupa from their last generation left, and there's going to be way more in this one than any other. I expect atleast an additional 20+ pupa from this one. Hey guys!! I have never been so excited to update a colony before! This colony now has 26 workers and 1 major!! She had a horde of workers around her and I was wondering what was going on but then they slowly moved off of her and I had to run and get my camera! Her abdomen was so full of honey; it seems like they've designated her as a replete. It was a magical moment seeing her but she is quite small. Her mandibles are huge which will hopefully support the colony in cutting up insects. In addition to the new major, they've also produced 2 pupa that are WAY larger than the one that just enclosed, so I think we'll be seeing some larger majors very soon. Secondly, they have an enormous amount of brood and the queen has gone back into egg laying mode... AGAIN. There's a absolutely giant batch of eggs that have just been laid along with the previous batch which have almost all hatched into larva. After seeing all of this today, I am sure this colony will exceed 40 workers this year. As always, here is the colonies information for any new visitors. Colony Establishment: July 5th (First Worker) | Approx. 46 days since first worker. Colony Diet: Has remained consistent, with the exception of spiders/beetles occasionally. Now time for some pictures. Needed some good news you delivered. Awesome! When do you plan for hibernation for your colony?